It’s common that we don’t have any backup when we just deleted iMessages by chance. Though it’s always a good habit to regularly back up our iPhone, there’s not always time for us to prepare before accidents. 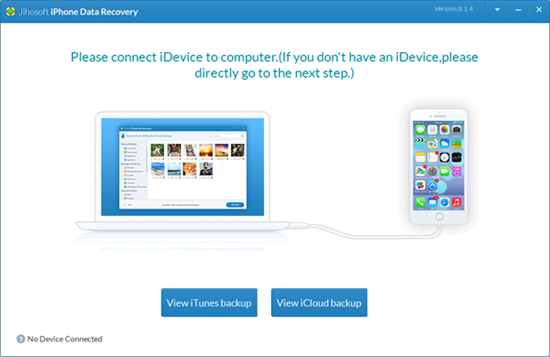 In such cases, iTunes or iCloud backup will be useless, and our only chance would be brought by some data recovery software like Jihosoft iPhone Data Recovery. 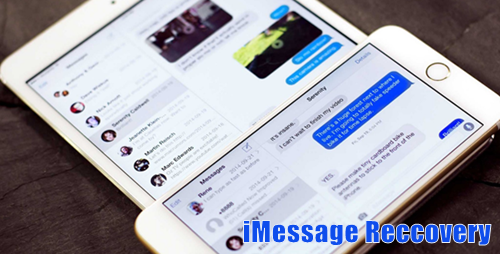 It is a professional iMessage Recovery tool which helps you recover recently deleted iMessages from iPhone or iPad without backup before the SQLite database gets overwritten by new messages on your iOS device. That means you’d better turn on the Airplane Mode as soon as you accidentally erase iMessages to avoid receiving new messages. Step 1: Install and run Jihosoft iMessage Recovery software on Win or Mac computer. Step 2: Connect your device to the computer and start scanning for deleted iMessages from iPhone or iPad. Step 3: Click on Messages item; Preview and select the deleted iMessages you need. Step 4: Click on “Recover” to save your iMessage onto PC as html, txt, csv files. After launch the Jihosoft iMessage Recovery tool, don’t connect your iDevice, and choose “View iTunes Backup” or “View iCloud Backup” instead. Follow the onscreen instructions to scan for your old iMessage chats. Preview and get back the deleted iMessages from iTunes or iCloud backup. If you’ve activated the ‘Messages’ slider on iPhone/iPad Settings > iCloud, then all your iMessages won’t be stored in iCloud backup anymore and hence the result would be empty. Please turn on the Airplane Mode on your device during the process in case that some newly-received messages may overwrite the deleted iMessages in its database. Because overwritten database of iMessages might be never retrieved. For iPhone data like photos and iMessage, iCloud is always a good place to save and backup, sometimes even better than iTunes since it can be accessed anytime anywhere as long as you have network connection and no need for computer. Similarly, it is always one of the best ways to restore your deleted iMessages onto iPhone or iPad, though you may lost other current data. 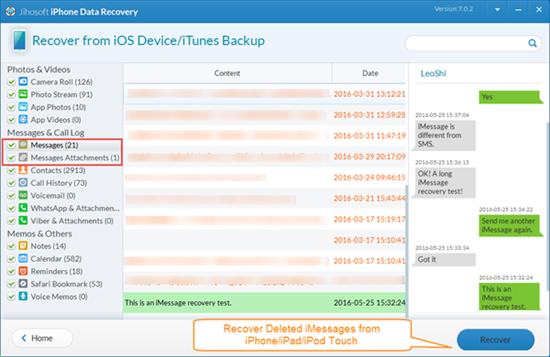 Before you start: If you are not sure about whether the wanted iMessages are included in your iCloud backup, you’d better use Jihosoft iPhone data Recover to view them first as mentioned in the Option 1. Because this will erase your iPhone then restore it from an old backup. 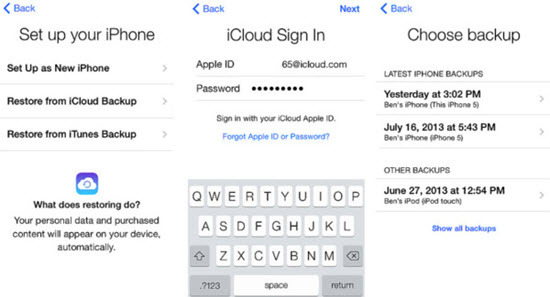 On your iPhone or iPad, go to Settings > [Apple ID] > iCloud > iCloud Backup and check the latest date of your backup created (must before you deleted the iMessage). Then click on Settings > General > Reset > Erase All Content and Settings to wipe out your device. After the process done, you will reach the page as you first use the device, but now you should choose Restore from iCloud Backup, and select the extact backup file. After restoring, you will find all the deleted iMessages will be back on your iPhone or iPad. You must be very cautious with this method, for it will wipe out all the current data on your iOS device, if you don’t want to lost some precious data that haven’t backed up. This method may not work for those who have activated ‘Messages in iCloud’ feature as iMessages won’t be saved in the backup section. Some people may wonder: can they recover deleted iMessages from iPhone or iPad on their Mac computer? The answer is yes, but chance are that you’ve set message syncing between your iPhone and Mac (with the same Apple ID), and you’ve Time Machine enabled on your Mac PC, because the only way to restore your iMessage history on Mac is by using Time Machine backup. On your Mac go to mac_HD > Users > [local username] > Library (macOS Sierra & later). Then click into Messages > Archive to find the subfolder created at the day before you deleted the iMessages. 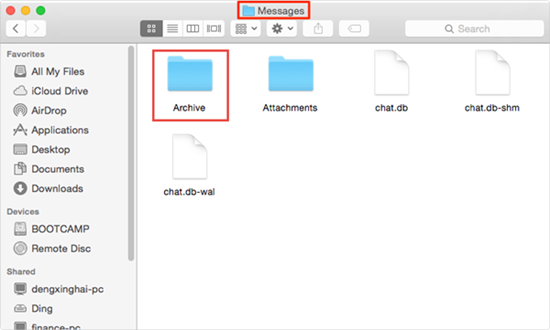 Restore that subfolder to get back the deleted texts on Mac. Go to Messages > Preferences > General on your Mac. Check on the box of ‘Save history when conversations are closed’. For every iOS users, iCloud and iTunes are two different ways to back up all their data on Apple devices. Though iCloud is comparatively more convenient, iTunes is the stronger one for it can back up almost all the data on iOS device. Before you start: Yet this still has the same problem as iCloud backup as it will wipe out all your current data on iPhone when you restore deleted iMessages from iTunes backup. So you must ensure that you can preview those wanted iMessages are there in the iTunes backup via Jihosoft iPhone Recovery in Option 1. Launch iTunes on your computer and check on ‘Prevent iPods, iPhones and iPads from syncing automatically’ to avoid the new syncing change the backup data. Connect your iPhone to computer and go to the Summary page, check on the date of your latest backup. Then click on ‘Restore Backup’ and wait for the process finished. Afterwards the deleted iMessages will be back to your iPhone or iPad again.